If you are looking for a high-performance sports car with iconic style, Jaguar Colorado Springs has the perfect car for you. Check out this gently-used 2014 Jaguar F-TYPE currently in our inventory. This beautiful convertible sports car offers a powerful 495 HP supercharged 5.0L V8 engine, propelling you from 0 to 60 MPH in an impressive 4.2 seconds. Plenty of power for passing on two-lane roads! This exciting Jaguar is loaded with premium features including Premium 770W Meridian audio system with 14 speakers, Brake Assist, sporty red brake calipers, and Navigation. Your F-TYPE will also include Switchable Active Exhaust, Configurable Dynamic Mode, and more premium Jaguar features to explore! That includes a variety of innovative packs such as the Performance Pack V8 S which includes Super Performance braking system, electronically controlled differential, quad exhaust pipes, 14-way adjustable soft grain leather sport seats, 20-inch Blade Twin 5-spoke alloy wheels, and more exciting features! The Climate Pack has heated seats and steering wheel while the Premium Package includes a wind deflector, garage door opener, and lockable interior storage. Your sports car will really turn heads especially with the Design and Black Pack 3. This pack features gloss black exterior trim, body-colored side-sill extension, rear diffuser, bumper splitter and aero splitter. This beautiful F-TYPE has low mileage with only 12,225 miles on the odometer. 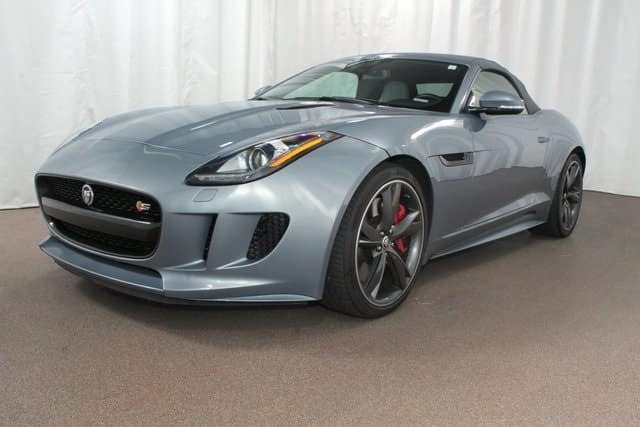 Contact Jaguar Colorado Springs today to learn more about this exciting 2014 Jaguar F-TYPE! Did you know that Jaguar Colorado Springs even offers FREE SHIPPING of this beautiful sports car anywhere in the Continental US? That’s right…you don’t even have to be local to purchase this gorgeous sports car today!